When India's Interfaith Couples Encounter Threats, 'Love Commandos' Come To Their Aid Couples who marry against their parents' wishes sometimes risk their lives in doing so. That's where the Love Commandos come in. They run 500 safe houses and help couples elope or hide from relatives. 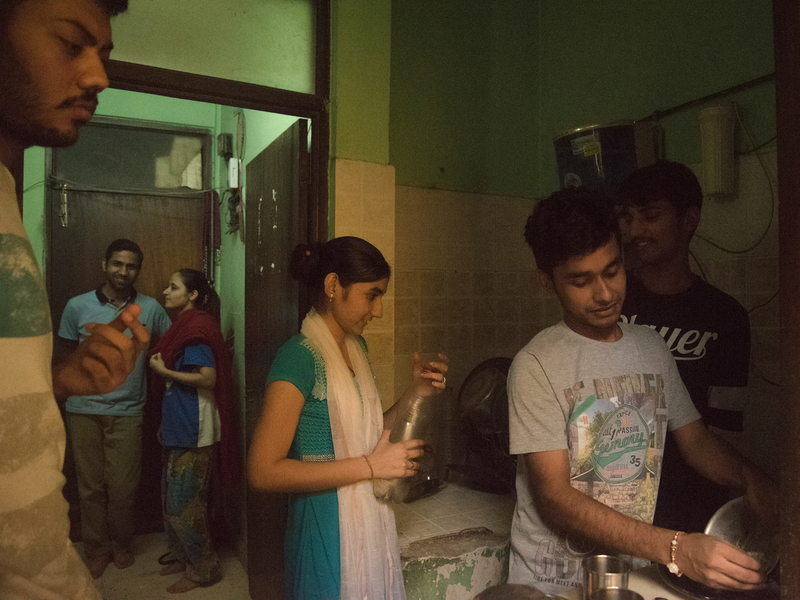 Newlyweds Saumil and Zarina Shah stayed at a safe house in New Delhi run by the Love Commandos, a group that rescues interfaith and inter-caste couples from potential violence and helps them hide from their families. It was three years ago, working at an electronics store in his hometown, that Saumil Shah first laid eyes on the woman who would become his wife. Saumil, now 31, was back in the western Indian city of Ahmedabad after getting an MBA in Manchester, England. Zarina had just earned a computer science degree at a local university. They flirted at work. And soon, "We started meeting each other outside of work," Saumil recalls, smiling. "Then we fell in love." Zarina, now 26, says she knew right away. "I feel good with him. I'm very happy with him," she says, blushing. The future, she adds, looks "very bright." Saumil and Zarina recently got married. But there was no big wedding. They eloped far from home. They didn't tell their families. They couldn't. Zarina's family is Muslim, and Saumil's is Jain, one of India's smaller faiths. Both their families had forbidden them from marrying one another. In India, parents have a big say in who their children marry. Four out of five Indians have arranged marriages. If you fall in love with someone from a different caste or religion, relatives can get angry. In some cases, they can turn violent. The Shahs weren't sure what their relatives were capable of. "Her parents didn't agree with this, and the same with my parents — even though she's a good person," Saumil says. "I'm a good person for her family, but it's just because of the religion." Saumil and Zarina Shah (background) help do chores with other newlywed couples at a Love Commandos safe house in New Delhi. They arranged meetings to introduce one another to both sets of parents and extended family members. They pleaded. They're no longer teenagers, they argued, and they're both well-educated. They had dated for nearly three years — plenty of time to think things through. But in July, Zarina's family arranged for her to marry a Muslim man instead. "It would have ruined my life," she says. She and Saumil decided to escape. "Her brother works at the airport. So we had to decide on a day when her brother has off, and we had to run away in the night," Saumil explains. "We were actually scared. Anyone could catch us." They both still lived at home. Zarina's parents were suspicious. She pretended to be asleep when they peeked into her bedroom at 2 a.m. Then Saumil pulled up in a taxi outside. Zarina tiptoed out of the house she grew up in. She scaled a locked gate out front, tossed away her phone — and fled with the man she loves to a city neither had ever visited: the Indian capital, New Delhi. That's where NPR met them in September, at a safe house run by a group that calls itself the Love Commandos. Since its founding eight years ago, it has helped interfaith and inter-caste couples elope and hide from their families. Founder Sanjoy Sachdev says the group, which has received support from the Indian online dating site Shaadi.com and Swedish tennis star Björn Borg, runs 500 shelters across India. Clients share household chores while in the Love Commandos' care, and reimburse the group for fees for the cost of arranging marriage licenses and other services. Most of the shelters have strict security measures: triple-deadbolt locks, metal detectors, no cellphones allowed. Sachdev says he gets threatening phone calls every day from the parents of those he helps. "These parents watch movies full of love stories, and when a love couple is separated, they feel sad," he says. "But when their daughter is in love, they beat — and even kill." Sachdev says over the years, he has had one client, a young man, who was murdered by his in-laws. He did not offer details. 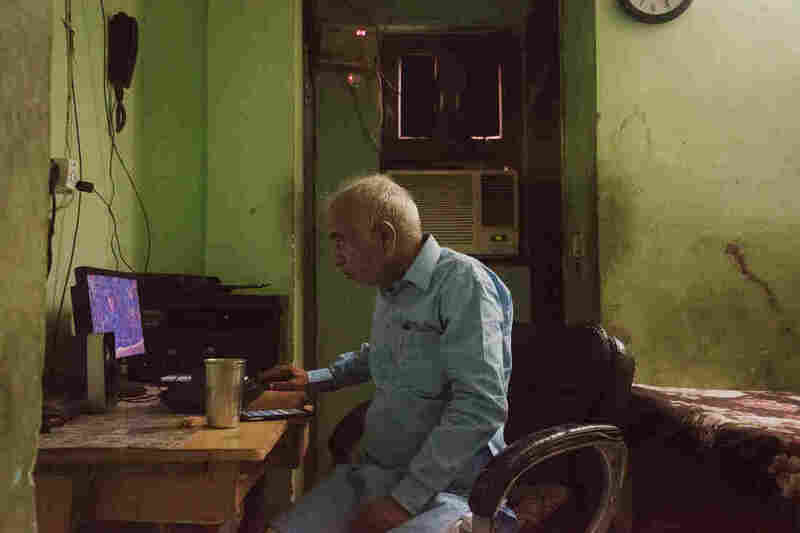 Sanjoy Sachdev, founder of the Love Commandos, at his office inside one of the group's safe houses in New Delhi. His group helps rescue interfaith and inter-caste couples from potential violence, offers them temporary shelter, and helps them do paperwork for marriage certificates and police restraining orders, if necessary. In a different case in September, police in the southern Indian city of Hyderabad said a father hired a hit man to hack to death his son-in-law in the street, while his pregnant wife stood beside him. Theirs had been an inter-caste marriage. India only started keeping track of so-called "honor killings" — murders committed by family members who believe a relative has brought shame on them — in 2014. The most recent statistics available showed 71 such murders in India in 2016. But honor killings are notoriously underreported and activists say there are thousands of mysterious "accidents." For every young lover killed, dozens of others face harassment from their families. Women often get it worse, Sachdev says. "Their education is stopped [by their parents]. Their employment is stopped. Their movement is stopped," he says. "Telephones are snatched. They are forced to marry anybody else. Then they have to escape." For six weeks, Saumil and Zarina stayed day and night in a windowless room with three other couples in the same situation. It takes time for the Love Commandos to help arrange religious conversions, weddings, police restraining orders and airline tickets to start a new life far away. "I still love my parents. I still think they're good people," Zarina says. She doesn't know if she'll ever see them again. The Love Commandos aren't the only option for couples in this predicament. In southern India, there's a smartphone app called Kadhal Aran, which means "protecting love" in the Tamil language. It's aimed at helping couples who want to marry outside of Hinduism's often rigid caste system. "It's a very simple app. Whenever people need any help — [if] they want to go to the police station, but they have fear, they can just download the app, and that's it," says Vasumathi Vasanthi, the software developer who designed it. "We will be there to help you." The app pings a network of volunteers, who connect app users to lawyers, police or counselors. Since its debut a few days after Valentine's Day in February 2017, more than 1,000 people have downloaded the app, which is free. About a dozen couples have received assistance through it, developers say. It's currently available only on Android, but they're working on an iPhone version. "Using technology, we can reach out to almost every corner, [even to] people who are in a remote village. Most people in India now have cellphones," Vasanthi says. "We know how hard it is, the family system. We understand the sensitivity." If technology is being used in some cases to help rescue couples in danger, it's also helped many others meet in the first place. In the past, Indians didn't socialize much outside their faith or caste. Now social media has helped break down some of the old barriers. "I think the numbers [of couples in danger] are increasing now," says Ranu Kulshrestha, co-founder of a national support group called Dhanak, "rainbow" in Hindi. It advocates for the "right to choice" in marriage and relationships and gives counseling to interfaith and inter-caste couples. "It's exposure to smartphones. They're also studying together. More girls are going for higher education," says Kulshrestha's husband, Asif Iqbal. Kulshrestha and Iqbal are an interfaith couple who got married 18 years ago and founded Dhanak to help others like them. Working out of donated office space, they run a volunteer network of 800 couples across India, and get an average of 50 calls or emails a day asking for help, Kulshrestha says. 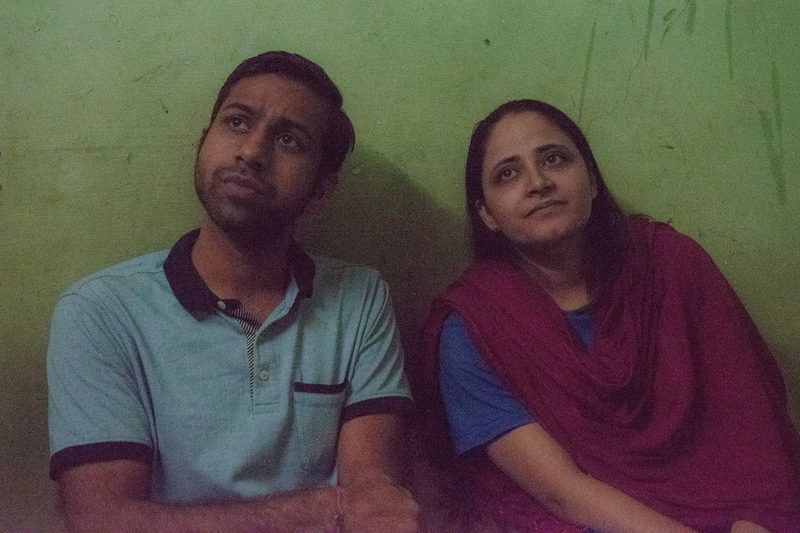 Ranu Kulshrestha (left) and Asif Iqbal (right) are an interfaith couple and co-founders of Dhanak, a support group for couples like them in India. The name means "rainbow" in Hindi. When NPR arrived at the Dhanak office in New Delhi, Iqbal was on the phone with a client who was threatening suicide. Often the most urgent protection couples seek is a marriage certificate. Without a legal marriage, a woman's family can accuse the boyfriend of kidnapping, says Iqbal, who, in addition to volunteering with Dhanak, works full-time in child protection services. When police respond to such a situation, typically, "They hand over the girl to the parents," Iqbal says, "even if she's 30 and she's not willing to go with the parents. [Police] come with the perception that the ultimate decision and authority lies with the parents." But when a couple is married, it's a different story. They have a legal right to live and travel together. Hence, the rushed weddings that the Love Commandos help arrange. In addition to assisting couples getting married across caste or religion, Dhanak also counsels their parents and supports couples over time, well after they have escaped potential violence. "You discuss things like 'what will be the religion of the children?' Sustaining the marriage, even when they find difficulty in getting a house," Kulshrestha says. Many landlords in India won't rent to interfaith or inter-caste couples. Weeks after NPR met Saumil and Zarina Shah in the Love Commandos' safe house in New Delhi, Saumil sent a text: They're out. They've moved to Mumbai, they're looking for jobs and they managed to rent an apartment. It's their first home together — alone, the two of them. NPR producers Furkan Latif Khan and Sushmita Pathak contributed to this report.